Cuts 1-3/8 acres per hour. Mounts to tractor in less than a minute without tools. 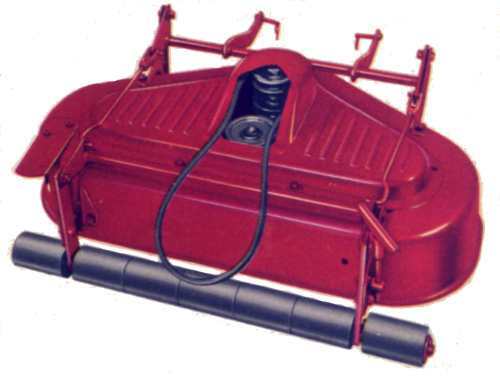 The patented "free-floating" feature which means "no scalp" is accomplished by using the front wheels of the tractor to tilt the mower over uneven ground. The 32" mower has ball bearing spindles, high carbon hardened steel blades and a heavy walled steel housing with extra large chute to prevent clogging. One point control for simple height adjustment. Leaf mulcher included. Requires 990211 Center Mounted Power Take-Off. Shipping weight: 110 lbs.